MtoZ Biolabs provides protein phosphorylation analysis service with highly efficient phospho-peptides enrichment processing and Nano LC-MS/MS analysis. Coupled with SILAC/iTRAQ labeling, this service can be applied to large-scale phospho-proteomics analysis. 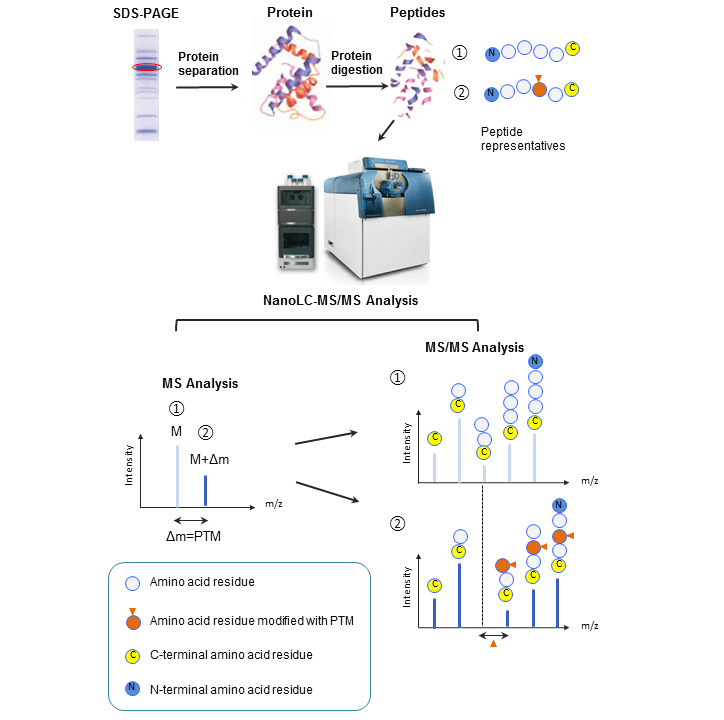 MtoZ Biolabs provides precise acetyl-proteomics analysis service using Nano LC-MS/MS. We also use CST acetylation-specific antibodies for acetyl-peptide enrichment, and 2-3 different enzymes for protein digestion to ensure full scan of acetyl-peptides. MtoZ Biolabs offers protein ubiquitination identification and quantification service using high-resolution mass spectrometry analysis. We also use highly specific ubiquitin antibody for enrichment of low abundance ubiquitin-peptide. MtoZ Biolabs utilizes the HCD/ETD mode of Orbitrap Fusion mass spectrometry for glycoprotein analysis. Coupled with Byonic software, we can accurately analyze N- and O-linked glycosylation sites and the corresponding glycogens. MtoZ Biolabs provides disulfide bond analysis service at both single protein level and proteome level. We have optimized our sample preparation method to reduce the chance of in vitro disulfide bond exchange and maintain the native protein structure to the greatest extent. MtoZ Biolabs has optimized our sample preparation protocols to obtain highly purified histones with the least effect to the modification, and ensures precise histone modification analysis using Nano LC-MS/MS. *Note: We also provide custom analytical service to identify many other types of PTMs. For special requirement, please contact us for project discussion. Format Liquid and Gel samples are acceptable. Quantity A total of 5-10 ug proteins are required. Protein sample <5 ug can also be analyzed for specific types of PTM. Please contact us for special requirement. Purity Detergents, such as SDS and salt should be as low as possible, especially for low amount of sample. Note All reagents/solvent used must be of the highest purity to reduce contaminating substances. Samples should be handled with extreme caution and always in clean condition. Any source that may introduce contaminating proteins should be eliminated. *Customers are welcome to contact us for detailed sample requirements before sending your samples. In this study, the ubiquitination modification sites of a Co-IP protein sample are analyzed. Part of the final analytical results is listed as below, showing the peptide sequences and identified ubiquitination sites respectively.